Travel For FOUR | Where in the world are they now? When we first moved to London in 2006, we heard of people traveling to the Canaries for a dose of winter sunshine and added the islands as a possible destination for our upcoming travels. As is usually the case, things shift up and down on the list based on who we’ve spoken to, books we’ve read, documentaries we’ve seen, articles in the Economist, etc, etc, etc…so, here we are in 2015 having just visited the Islands–well over 8 years since it first appeared on our ‘to do’ list. Also as per usual, we purchased the guidebook for the Canaries well in advance of our actual trip. As in years in advance–so far in advance that we had to rebuy current books before our trip?! So, if you’ve ever felt a tad overwhelmed with choice upon setting out to plan a trip, you’re in good company. Upon first traveling to Europe together in 2004, we picked up a Rick Steves guide to Italy and used it as our ‘Bible’ for planning the trip. At the time, the book was filled with opinions and his taste and travel style matched with our own. So, Rick Steves made the daunting task of where to go way more manageable for us. 11 years on, we’ve traveled to well over a majority of the places Rick’s guides cover and have run out of ‘easy’ options. We now have to see through the ‘data and options’ provided by other guidebooks–pairing guides’ advice with opinions and reviews online in order to arrive at a solid itinerary and accommodation plan for each trip. Having been in the UK for a while now, we also realise that the Canaries aren’t really the UK’s answer to Hawaii… The Canaries were and are a major winter travel destination for Europeans and as a result, the islands aren’t ‘authentic’. And they’re not posh. That said, by perusing the guidebooks and review sites, we landed in a lovely rental villa very near the path to the Papagayos beaches, found an authentic Spanish-speaking grocery store nearby and a great cycle-hire company just up the hill. Though it was a bit chilly during our stay (darn wind chill), it was ~20 degrees C each day and we managed to get some good beach time in (albeit we were fully dressed in layers). The 7km boardwalk cycle path along the coast in Playa Blanca made for a great active day adventure for us–it’s a smooth ride with little ones in tow. Well done, Playa Blanca, for installing it. 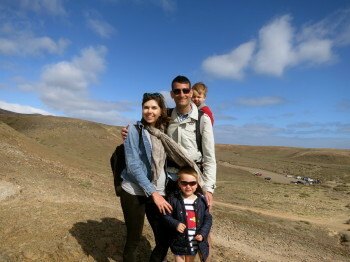 On a particularly windy day, we visited sights around Timanfaya. 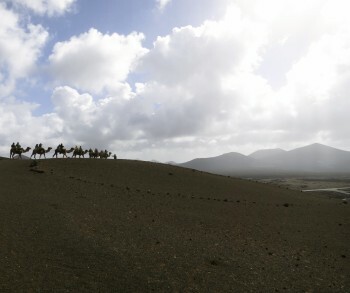 We rode a camel (Tsunami was his name), saw volcanic craters, held stones warmed by the earth’s heat and nearly blew away! 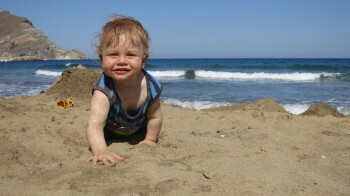 All this said, we’ve visited many patches of sun-drenched winter sand which would put Playa Blanca to shame. Lanzarote’s strength is cost. 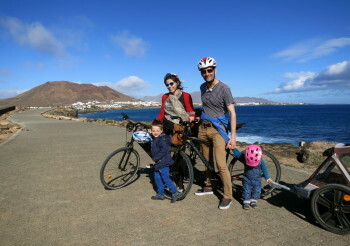 All in (7 days in a private 2-bedroom rental villa, air fare, food/drink, rental cycles, etc), our trip to Lanzarote cost well less than only just the airfare for our brood to travel to Asia. Oh, and there’s no time change…that easily tips the scales for our eventual return. 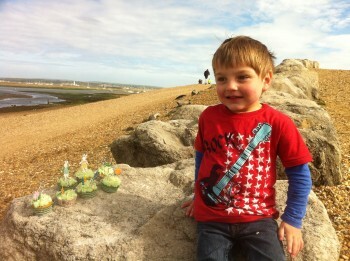 Our eldest son, Walker, was born in April 2011–just over 4 years ago. 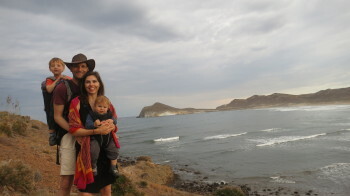 For a year or so, we were able to happily go about our travel adventures in a manner very similar to our usual style pre-kids. But once babies become mobile toddlers and/or there are two to tow about, things change. They did for us, anyhow. 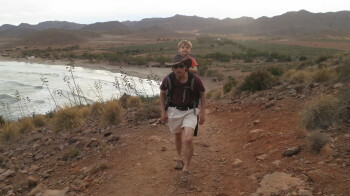 Adventuresome hikes become cycles complete with baby seat. We traded jaunts to lands less traveled for a sunny patch of sand somewhere, anywhere. Our boys will eat just about anything, so food’s never a worry…but white tablecloths become a playtoy…or worse…a napkin. So, seeing that it’s been nearly 1 year (gasp!) since our last post, we thought it worth shedding some light on what we’ve been up to. We’ve stumbled upon a travel calendar which works for us…visiting the States to see family ~ every 9 months, a week of winter sun in December-February, Spring sun (April) someplace warmer than the UK and Spring/Summer months spent in the UK (June to mid-September). And we try to visit a new country every year (Denmark last year). For this stage, this plan works well for us. Last September, G and I went away for a weekend. Thankfully, our nanny was available to keep the boys at ours while we were away in Copenhagen, so they were well cared for maintained a sense of normalcy despite our travels. 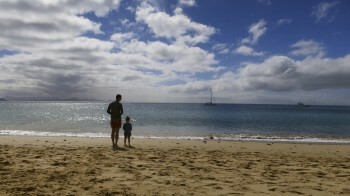 Next, we went to Lanzarote for a dose of winter sunshine (and G’s birthday). And in April, we ventured back to the States to visit our families and a couple friends in Virginia. For all the tradeoffs, our new travels are just as special as the old–albeit special in a new way. 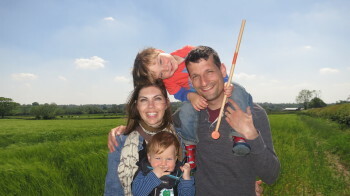 Rather than an exploration of new cultures and possible ‘life paths’, our recent family travels serve as quality time spent reconnecting with one another and enjoying the odd dash of sun. Stay tuned for a few long-overdue posts Copenhagen, Centre Parcs (UK), the Canary Islands (Lanzarote) and the States. Has anyone ever seen those ads for Andalucia in the airport? The ones with a wide, white sand beach and a beautiful brunette with a breezy look about here? Having experienced Andalucia now myself, I’d suggest that a more appropriate truth would have this gorgeous lady beckoning toward a bowl full of hydroponically grown tomatoes…or perhaps a lovely courgette. This may seem odd, but anyone who’s traveled through Almeria province (part of the region) would have to agree as a huge swathe just out of frame from the major tourist resort destinations is covered with plastic greenhouses. 80,000 acres worth, in fact. (BBC have a great documentary about it). Something I read upon returning said that these greenhouses are the second-most notable manmade creation viewable from space (the first being the Great Wall of China–which apparently was strengthened as the workers used sticky rice in the brick mix…can anyone tell me if this is true as I learned in on a Bear Fruit country card. Not the most reliable source, right?). In any case, stepping aside from this little fact, we had a well-needed family rest in Andalucia. 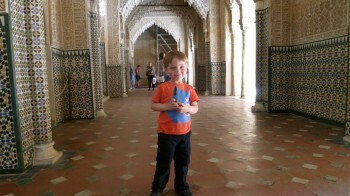 First, a couple nights in Granada to see the Alhambra (a World Heritage Site). Surprisingly, W loved it. 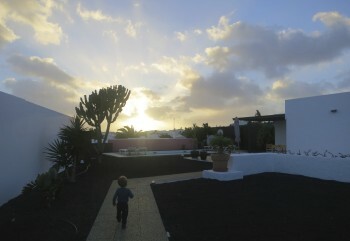 And C loved crawling about in the safety of the Spanish-style walled garden in our cottage for the stay. 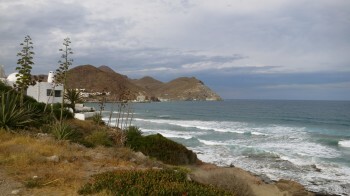 Then, a train and bus combo zipped us off to San Jose–a little town secreted away in the Cabo de Gata national park. We chose this area as it’s where Spaniards holiday–and we wanted to practice our language skills. Being the off season, we had the whole place to ourselves. We hiked one afternoon–but mostly, we just had good quality time with the boys building sandcastles and playing in the waves. It’s our first immediate-family only holiday as a family of four. Long overdue. But better late than never. Back when G and I lived in the States and drove everywhere, our motto was ‘What’s a trip without a U-turn’. 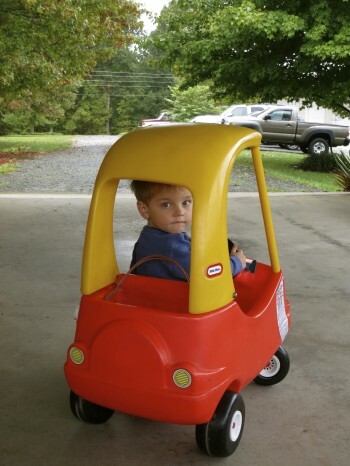 So, as family travel goes, what to say…As the mum to two carsick little men and wife to another big one, thank goodness for public transport…and dramamine. In my first real job after Uni, I worked for a teeny ad firm. There, I became painfully aware that my inner mind speaks in cliches. Suffice it to say that I wasn’t (and am not) a copywriter by any measure of talent. Happy to report that after a decade or more of reading real literature instead of People magazine, I’ve improved on this front…but I’m still at want for wit. So, really, it should come as no surprise that as an over-stimulated, under-rested mummy of two–majorly deprived of ‘me time’ and adequate solid literature, I’ve reverted back to my cliche ways despite my grandest efforts. And barely a day goes by that I fail to utter at least a few cliches…and sometimes I even discover where a cliche may have rooted from. A recent example: ‘hopping mad’. Attempting to take C out of the bath at time when he wasn’t ‘done’, he was ‘hopping mad’. How could I tell? He cried (wailed even), began to cry so overcome that his face became tomato red and began to sweat AND began hopping up and down. So, as I go about…I’m learning that sometimes cliches are useful. At times when we feel we’re alone (ie with a wailing child who’s hopping mad), realising that generations before us have experienced the same suddenly makes me feel a bit less alone. It’s as if my grandma’s up in heaven playing bingo checking off the cliches I utter–but more importantly, those I understand–as if they’re milestones in my life’s book. So, lately, the cliches which resonate most? The days are slow, but the years are quick. So, this post is a fancy way of my announcing that our boys aren’t babies anymore. Back in April, we asked W how he’d like to celebrate his 3rd birthday and he requested a family hike (it’s in the genes, apparently). 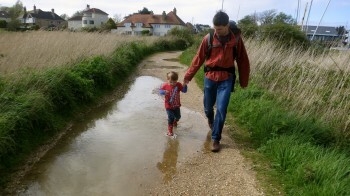 We obliged and ended up along the south coast for the day–in the New Forest by Lymington. We played with sticker books on the train as we watched the wild horses out the train window. It was a gorgeous day with incredible sea-views, but very windy. C was in the Baby Bjorn. 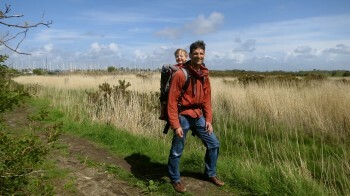 W was in the Bush Baby hiking backpack–and also walked a bit, as well. In all, we hiked 6 miles before finding ourselves drenched by a quick-moving storm and ducking into a pub for comfort and a fresh, hot meal. And for C’s first birthday in May, G’s parents were in town. 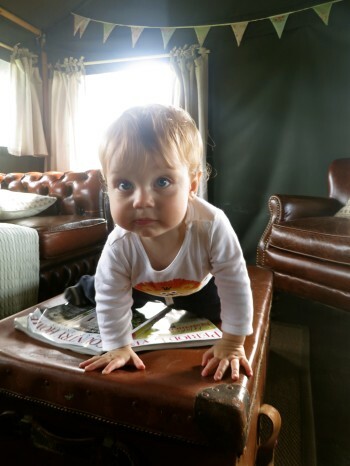 We went glamping in the English countryside. It’s camping–but with beds and running hot and cold water and a gas-powered fridge, as well. So, in short, we had everything but electricity. Since we live in a big city, we like to ‘get away’ to the middle of nowhere. 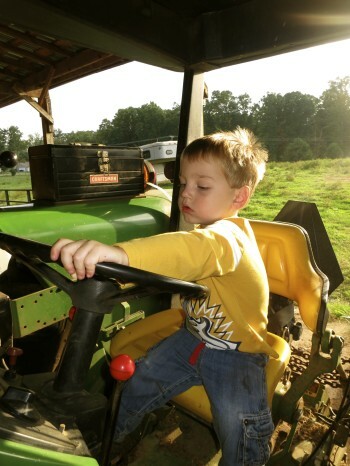 This time, we went to a goat farm–it’s called Dandelion Hideaway–and was a great place for us to spend an extended weekend. W groomed a Shetland Pony. 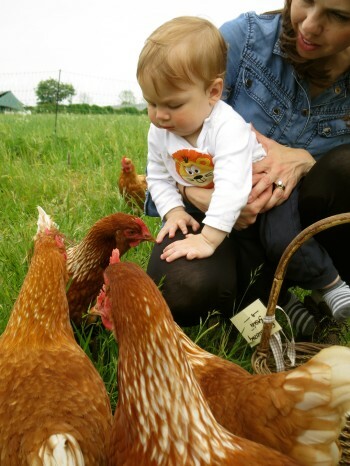 C collected eggs from our chickens every day. Both W & C were kissed by a baby goat while I wasn’t looking (but luckily, I was pressing the shutter for our camera). We fit in a short hike. And everyone had naps daily. Oh…and plenty of s’mores and birdnest cupcakes were had by all. So, given the ages of our boys…I suppose this post is some kind of goodbye to pregnancy and babyhood. It’s been fun…mostly. I, K, constantly think…’if only we could bottle this time to enjoy later’. This time is intense and without respite, but I am certain one of the most worthwhile and lovely of life. We’re doing our best to savour it…well, as much as you can while literally running at full speed with a Baby Bjorn strapped onto my chest and pushchair to catch the next bus. 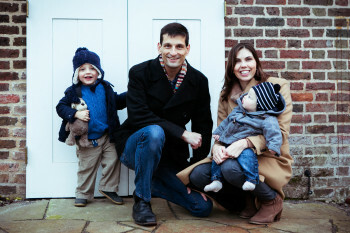 To sum up the changes 2013 has brought, we now live in a new house (to us–though built sometime around 1910), in a new borough (Herne Hill–south London), with a new addition (ever-smiley Coleman). We moved to Herne Hill 19 April. Coleman was born 19 May. Writing this in November, Herne Hill feels like home to us now. Herne Hill has the essential shops (garden centre, cafe, groceries, gourmet butcher (it’s new), lovely pubs, bookshops, toy store, pharmacy, etc) all within ~4 minutes of our door. And our station is also a 4-5 minute walk away and has us to the center of town within 10 minutes. We love it here! It’s certainly not so posh as Belsize Park, but it’s very ‘us’ and we’ve already begun to make local friends. In fact, K runs into the same people from the various playgroups and childrens activities all around town, we’re certainly not anonymous here and the huge number of children in the new borough (London’s nappy valley, supposedly) means we’re amongst our peers. Coleman has been a super-star. The birth experience was a lovely 1 hour 40 minutes preceded by a 6 mile hike across London to coax him out. We never even had to go into hospital. 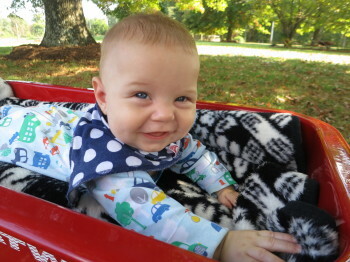 He’s been amazingly smiley, happy and inquisitive ever since–he seems very social. At 6 months now, he’s eating table food and sitting up. It’s a joy to be his parents. He’s wishing for teeth this Christmas. When C reached 3 months, I (K) and C traveled for a quick weekend to visit a friend in Netherlands (Lottie)–and we traveled with our friends’ family (Andy, Chiaki & Co–meeting them in Helsinki before venturing to St. Petersburg together on an overnight ferry. We loved both Helsinki and St. Petersburg. The big surprise was how incredibly family friendly both cities were. 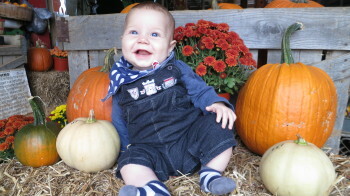 And, of course, we traveled back to the States in October of this year to introduce C to the extended family. 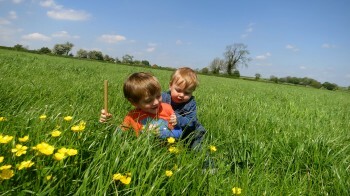 The boys LOVED it there. And I think we all were a bit depressed upon returning to London after being completely spoiled for two weeks. And though the visit was fun-filled, I think grandparents were depressed thereafter because they aren’t able to see our boys so often as they would like. We brought some remnants of our State-side life back to London with us this time. Silverware, a couple paintings, our wedding album, Christmas ornaments, our favourite dolls/toys from childhood (for the boys to adopt), sentimental kitsch from our old house/life for display on the bookshelves. Having bought a house in London, it’s high time to make it feel more like a representation of our ‘joined up’ life chapters rather than simply the UK. We’re looking forward to putting up our tree this year, complete with the angel we bought and Christmas treekskirt K made in time for our second Christmas together. Diana, K’s friend from Uni, also paid us a visit this October and we had a great time showing she and her sister about town. With her visit, we’ve now seen all 4 of our wedding attendants in London. 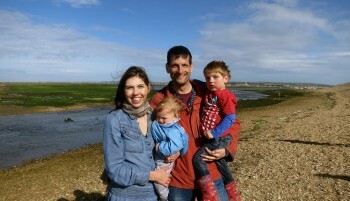 And G’s parents will have spent ~6 weeks here with us in the UK this year (7 weeks total with us counting Hawaii). We’ve been very blessed to have their help and support in London for so much of the year. K’s best friend from university, Diana, and her sister Rachel came to London in Late October. While visiting, they played with the boys and got to know them better, made family dinners, went to the pub, shopped (for about 30 minutes total , had wine with a view of Tower Bridge, Tea at Kensington Palace, had a glimpse of the changing of the guard and saw a majority of the most iconic London landmarks (Covent Garden, Trafalgar Square, Parliament, etc, etc, etc). 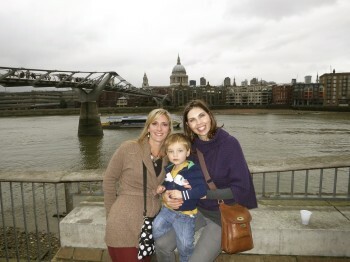 While living in the States, we spent lots of milestone days with these two and we were honoured and impressed that though they have 6 kids now between them, they took time away from their usual lives to visit us in London solo. This was their Di’s first visit to see us here in London and Rachel’s second and the house was a bit quiet and sad after they left us, good friends and a good spot of laughter make a house a home. Thank you to their husbands and kiddies for sharing them! Di and Rachel, our door’s always open to be your home away from home. 16 years of friendship and counting…goodness…maybe I shouldn’t say that aloud?! 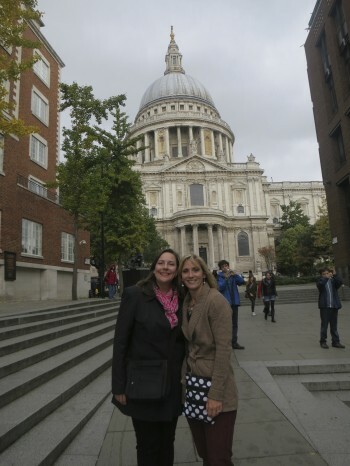 A bit of sidenote–with this visit, all of our wedding attendants have paid us a visit in London! 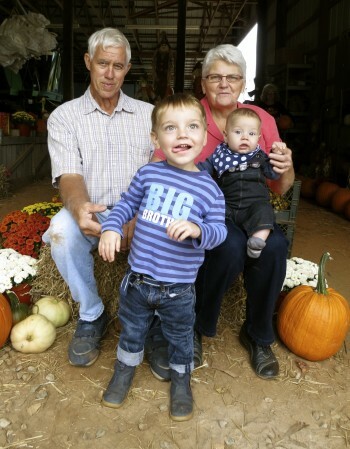 In October, we traveled back to the States to introduce Coleman to K’s extended family. This was our first trip back since November of 2012 and we had a really nice visit. 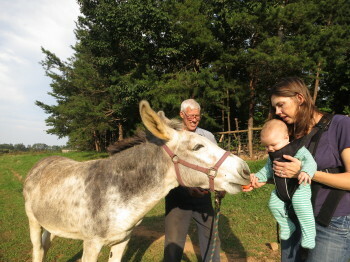 Coleman couldn’t get enough of grandma and grandpa’s cuddles (not to mention swinging, wagon rides, petting the cat, petting the donkey…). And Walker couldn’t believe his luck with all the new toys and playmates to enjoy. And since all K’s brothers, sisters, aunts, uncles, parents, cousins, grandma, etc, etc were around to visit, there were plenty of spare hands to give mum (K) and dad (G) a much needed break. In London, the boys are very clingy to Kimberly. They spend much of the week together solo and as a result, she’s their security blanket. This is great for attachment theory (not that we follow that convention), but not so great when mum needs a shower or when it’s dad’s turn to do storytime and bedtime for a change. 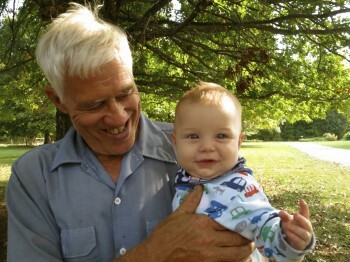 So, the boys being enamoured with grandparents was the absolute best gift of all. We ran out for a solo coffee one morning. Spent a morning in the storage unit (yes, we still have all the contents of our NC house in storage 7 years on, ridiculous…). And when we were at the house, we could still have some downtime there. So while we LOVE our London life and don’t plan to move on from this chapter anytime soon, we do also love our American respites. Though, K still wishes her family would travel. And this brings us to another theme. Living abroad–the pros and cons as evaluated 7 years in. For us, the big reason for moving abroad initially was to allow ourselves more opportunity to see and do things in Europe. The limited holiday allowance in the US (generally 2-3 weeks) didn’t really allow for many jaunts across the ocean. And low-cost air carriers made it easily possible to travel loads using London as a hub. Now, 7 years on, we realise that we’ve grown accustomed to the ways and life here in London and while we can’t say we’ll be here forever, we can say that it very much suits now. For any who have asked us ‘why’d you decide to stay in London’ over the years, I’ve recently found http://www.businessinsider.com/us-expats-in-england-2013-10which sums it all up much more eloquently than I have ever been able to. Sadly our most marked regret is one which we can’t impact or control. A majority of our family doesn’t travel. Of our immediate family members (K’s 3 siblings, K’s parents, G’s parents and G’s sister), only G’s parents have been to visit over the last 7 years of our living in the UK. And while we do see everyone while visiting Virginia and many of our immediate family have to make a large effort in order to see us there, it would make our life seem more ‘whole’ if everyone could see and experience a part of our life here. So, alas, life abroad (for us) does come with its tradeoffs…but that’s life? !